Template:Multiple issues In the fictional Bionicle universe certain Matoran (workers and villagers) are destined to become Toa: heroic warriors of great strength and power. The Toa's duty is to protect the Matoran and maintain peace in the universe. They usually work together in teams, with each member representing an element. Each Toa has near-complete control over their element, and can access the powers of the more powerful Great Kanohi Masks. As the Bionicle universe is based around a line of action figures, most Toa have appeared in their action figure. There were once as many as 3,000 Toa in existence, but after many wars, assassinations and murders, their numbers went down to 54. But before the final defeat of Makuta Teridax, their numbers climbed once again. Toa have been around for most of the Bionicle universe's existence. The first Toa to come into existence was Helryx, a Toa of Water. Though she exhibited most of the traits of a Toa of Water, she had a temper and could be stubborn. Though most Toa were once Matoran, it is known that the Toa Mata and Helryx came into being as Toa. Although Toa are, as a rule, heroes, there are some traitors to the code. Toa Nidhiki betrayed Metru Nui to the Dark Hunters. He was later mutated into an insectoid being who served the Dark Hunters. Another traitorous Toa was Tuyet, a Toa of Water from Lhikan's team. She was corrupted by an artifact from her homeland, the Nui Stone, and wished to use its power to rule the universe. She came close to succeeding, and was narrowly stopped by Toa Nidhiki and Lhikan. She was thought to be banished to the Pit. However, it was recently revealed in the official web serial, Reign of Shadows that she was sent to a pocket dimension, which she eventually escaped. Despite the recent takeover by Makuta Teridax, the main antagonist of the Bionicle saga, the Toa continued to operate, albeit in hiding. After Teridax's defeat at the hands of Mata Nui, the Toa migrated to the newly reformed Spherus Magna along with all the other Matoran Universe residents, who could now speak the Agori language. The chosen guardians of the Great Spirit Mata Nui, destined to awaken him if he would ever fall. They were known as the Toa Mata, six Toa warriors. In Matoran, "Toa Mata" literally means "Spirit heroes" or "Heroes of the Spirit." After their transformation in Energized Protodermis, they became the Toa Nuva, with improved armor, weaponry, and masks. They then added the suffix "Nuva" to their name, (meaning "New") and masks. After donning Artakha's Adaptive Armor, they were able to master any environment with its ability to adapt to the current situation. Tahu, Gali, and Onua dispatched themselves to the Karda Nui Swamp of Secrets, while Lewa, Kopaka and Pohatu left for the skies and stalactite villages to rescue the Av-Matoran. After using legendary Keystones to power the Codrex dome, Energy Storms raged throughout Karda Nui, killing every Makuta there (minus Krika and Icarax, who were killed earlier by Gorast for speaking against Teridax's plan). The storms confirmed that they succeeded in their ultimate quest to awaken Mata Nui, unaware that Makuta Teridax had taken over his body. They led a resistance movement against that same being. Because of Spherus Magna's reformation, Tahu's transformation, and Mata Nui's last wish (to find the Great Beings), the team has currently apart on different missions. Tahu's team has been known as the Mistika, in the Matoran language translating to "spirits of the swamp", with their armor adapting to a swamp environment with aerial capabilities armed with Nynrah Ghost Blasters. Kopaka's team also received a Matoran term, "spirits of the skies", or Phantoka, armed with Midak Skyblasters. The Toa of Fire and the leader of the Toa Nuva, Tahu initially demanded fierce loyalty to his command, discarding others' own opinions and ignoring them altogether, plunging them into dangerous tasks. As such, his team merely acknowledged him as a leader, but did not respect them. His aggression after arriving on Mata Nui was easily brought to surface, causing him to almost drive himself to madness with the burdens of his amnesia. Toa Mata Tahu's weapons included a Kanohi Hau (the Mask of Shielding), and a Fire Sword to channel his Fire element. Like his fellow Toa Mata, he collected five other Kanohi and went to Kini-Nui for a Golden Kanohi, containing the powers of the Kanohi Hau, Akaku (X-Ray Vision), Kaukau (Underwater Breathing), Miru (Levitation), Kakama (Speed), and Pakari (Strength). Tahu's appearance in this form is dominantly red with orange legs and arms. Toa Nuva Tahu's weapons included a Kanohi Hau Nuva, the Nuva Mask of Shielding. His Fire Sword transformed into two Magma Swords, which served to channel his Fire element or serve as a lava or surfboard. He collected five Kanohi Nuva to store at Ta-Suva, but were lost when Ta-Koro sank after a Rahkshi attack. Tahu Nuva's appearance slightly unchanged from his Toa Mata form, but bared silver shoulder and chest armor. Once he gained Adaptive Armor, his armor shifted in the Swamp of Secrets, gaining a Nynrah Ghost Blaster, and Rotating Blades which could also serve as a shield. After arriving on Bara Magna, he was devolved into a crude version of his Toa Mata self by the Ignika in order to wield the Golden Armor. As such, his adaptive weapon has taken the form of his old Fire Sword. Soon after, he was clad in Golden Armor and destroyed all the Kraata controlling the Rahkshi, which interrupted Makuta Teridax's concentration and gave Mata Nui his only chance to defeat the tyrant. After Mata Nui's victory, he helped lead the inhabitants of the reformed Spherus Magna, the original "paradise". The Toa Nuva of Air, Lewa is at peace with the skies and jungle of Le-Koro, flying upon its thick flora. Passive, Lewa is often eager to face his Toa responsibilities with carelessness, considering the entire ordeal of a fight as an "adventure". Cheery and light-hearted, he has no bounds. After briefly being controlled by both Makuta Teridax (after his Mask was infected by an infected Rahi, then rescued by Onua) and a Bohrok krana, he learned to take his urgent role not lightly, his will renewed to never again underestimate threats. After Teridax took over the universe, Lewa was transported to Tren Krom's island, who switched bodies in order to save their universe. Though their spirits were switched back by Arthaka, he was recently expelled into space along with everyone else in the Core Processor. He is currently on Bota Magna thanks to a dimension-hopping Vezon. Lewa Nuva is armed with the Kanohi Miru, Mask of Levitation. As a Toa Mata, he was armed with an Axe, later transformed to Air Katanas. As a Phantoka, he is armed with an Air Saber, and a Midak Skyblaster. Later on the journey of Karda Nui, he discovers the Axalara T9, and pilots it against Antroz in the Jetrax T6. The Toa Nuva of Water, Gali is as cool as the waters of Ga-Koro's bays. Seeking to contain Tahu's aggression and protect the unity of the Toa Nuva, she takes her role as a Toa with the utmost importance, and is willing to protect any sentient being threatened by the evils of the Brotherhood of Makuta. Considering her peaceful lifestyle, she is an accomplished warrior against those who threaten her allies, like the amphibious rahi that dwell near Ga-Koro. Gali Nuva is armed with the Kanohi Kaukau, Mask of Underwater Breathing. As a Toa Mata, she was armed with hooks, which later transformed to Aqua Axes. She also has propellers for swimming underwater. As a Mistika, she is armed with a Nynrah Ghost Blaster with laser sighting. She is completely blue in the film. The Toa Nuva of Ice, Kopaka prefers the isolation and silence of Mount Ihu in Ko-Koro. Deputy of the Nuva, his modus operandi is to work alone, often despising the Matoran's virtue of unity, but his analytical side persuaded him to go against his will after realizing it was the only way to fight Teridax. He also once saved Matoro from a Muaka. Kopaka is armed with the Kanohi Akaku, Mask of X-Ray Vision. As a Toa Mata, he was armed with an Ice Sword, later transformed to dual Ice Blades, and an Ice Shield. As a Phantoka, he is armed with a Midak Skyblaster equipped with a Protosteel Blizzard Blade attached with an aiming laser. The Toa Nuva of Stone, Pohatu is regarded as one of the friendliest Toa. With Gali, he continues to hold the peace between the Toa, but unlike her, is ready to do so in a friendlier way that benefits all of his friends. He also once rescued Takua from a Nui-Jaga that was spreading the Makuta's infection to the Po-Matorans' Kolhii balls. Pohatu is armed with the Kanohi Kakama, Mask of Speed. As a Toa Mata, he is armed with Feet Additions, durable enough to smash through a boulder, later transformed into an even stronger form, and he gained dual Climbing Claws. As a Phantoka, he is armed with a Midak Skyblaster along with Twin Propellers which double as drills. During his journeys in Karda Nui, he discovers the Rockoh T3, and pilots it against Antroz in the Jetrax T6. The Toa Nuva of Earth, Onua is very quiet, speaking only when he has something important to add. He is intelligent, wise, and strong. A running gag has Onua saving people at the last moment, including catching Tahu as he was dropped from the sky, Lewa when his mask was infected (Infected masks make the wearer serve whichever Makuta infected it), and when Lewa was controlled by a krana. As a Toa Mata, his weapons were his hands, which sported large claws. When he became a Toa Nuva, he received dual Quake Breakers, and as a Mistika, he is armed with a Nynrah ghost blaster and a Multi-Resistant shield. The Toa Hagah's history dates back to prior the coming of the Toa Mata during the early stages of Makuta Teridax's plan. The guardians of Makuta Teridax, the Toa Team was made of six Toa chosen specifically in reward of their previous deeds. Given an elite status and unique armor that identified them as Hagah, or Guardians in the Matoran language, and thus were named the Toa Hagah. The Toa Hagah served Teridax on Destral, deceived and manipulated to destroy the rampant artificial Bohrok the Brotherhood created, which were initially considered by the Brotherhood as a potential weapon, unknown to the elitist faction. Eventually, this deception did not last long, and they rebelled against Teridax and the Brotherhood when they discovered that they had committed theft and stolen the Kanohi Avohkii. When four of their number were captured by the Brotherhood, Norik, and Iruini, whom for different reasons were not, attempted a rescue but were mutated by Roodaka into Toa Hagah-Rahkshi mutants named Rahaga. Escaping with their lives, they were given a fate worse than death, and could never be accepted into Matoran society as true heroes. The "Rahaga", accepting their fate, turned to enemies of their nemesis Roodaka, saving threatened Rahi from the threat of the Visorak, who were commanded by the Vortixx and her King, Sidorak. Educating themselves about Rahi, they also searched for the mythical Keetongu (which possessed the ability to cure those infected with Hordika venom) to aid in their quest. Fate would have it as the Visorak invaded Metru Nui, the Rahaga in tow. Arriving to rescue the Toa Metru, sent to their deaths, they informed them of their mutation by Hordika venom into Toa Hordika, educating them in their new forms and the possibility of a cure in Keetongu. As of the original series' cancellation, they were preparing to go to the aid of the Toa Mahri, who had been brainwashed by a monstrous enemy. There, they helped the Toa Hordika when the Visorak took over Metru Nui. They were later transformed back into the Toa Hagah by Roodaka. On behalf of the Order of Mata Nui, They searched for Teridax under the Coliseum who altered their minds to see happiness and peace. They have since been snapped out of the illusion by Tren Krom in Lewa's body, and fought in the resistance against Teridax. Norik is the Toa Hagah of Fire, and the leader of the Toa Hagah, and was previously the Rahaga of Fire. In the discovery of the Brotherhood's rebellion, he allowed his team to become overconfident against their foes, paving the way for their capture. He, along with Iruini, was the only to escape the fate of his teammates, and teamed up with him to rescue them. Now changed to a Turaga-esque wise persona, he became cautious, but still preferred to lead psychically instead of verbally. He was also very concerned about Vakama's rapid primal transformation, and was the only one to escape capture once more when Vakama turned to the dark side with Roodaka. As a Rahaga, Norik was armed with a Rhotuka spinner with the Snare power, which tangled the limbs of a target. His Rahaga Staff could also be manipulated to distract his reptile Rahi prey (Norik specialized in the capture and study of these Rahi such as Furnace Salamanders) as he prepared to strike. Gaaki is the Toa Hagah, and formerly Rahagah, of Water. As a Toa of Water, Gaaki can create, control, and absorb water. This also gives her the ability to control water, create storms, and cause floods. These abilities were lost when she was turned into a Rahaga, but she has since regained her powers. Her Rhotuka spinner as a Rahaga was used to capture Rahi by flowing through the depths of water, attaching itself to the target, and floating them up towards the surface. As a Rahaga, she was feisty and always wanted to prove herself as good a Rahagah as the rest. She was also a translator, and her area of expertise was the capture of water Rahi. She always wanted to show the other Rahaga that she was a great expert in the capture of Rahi. She was visibly affected by her mask, as she often felt that the power was using her rather than the other way round. Bomonga is the Toa Hagah of Earth. As a Rahaga, Bomonga was known to hunt in absolute silence and preferred to work alone. His prey were the Rahi "hiders," insect and nocturnal species. Bomonga searched for Rahi under cover of darkness and was known to burrow into the earth to wait for the creatures to come near. From a place of concealment, he would launch silent spinners to incapacitate his targets. Extremely patient and skilled, he would wait for hours to catch one Rahi. As a Toa of Earth, Bomonga can create, control, and absorb earth. This also gives him the ability to control earth, and create earthquakes. He frequently used his Mask of Growth in battle, being proficient enough to bring down a Tahtorak, a Rahi far stronger than he. These abilities were lost when he was turned into a Rahaga, but he has since regained his powers. Kualus is the Toa Hagah of Ice. He can create, control, and absorb ice, giving him the ability to create snowstorms, to travel via ice bridges and more. As a Rahaga, he learnt how to speak the lauguage of flying Rahi, passing this knowledge on to Nuju. He could also play his staff like a flute. The Toa Hagah of Stone. He is known to be loud and boisterous and believes in plain speaking and taking direct action rather than sneaking around. He truly loves massive beasts and can teach others how to befriend them. As a Rahaga, he used a lasso spinner to capture the beasts and used his staff to leave an invisible mark so he could track them. He has since been turned back into a Toa. Pouks along with the other Toa Hagah defeated the Kanohi Dragon on Xia. The Toa Hagah of Air. As a Toa, he believed that the team needed to spend more time on more routine dangers, such as Rahi invasions; the rest of the team did not share this view, and the differences of opinion lead to him quitting the team. This meant he was not present when his comrades were captured, so he was able join forces with Norik again to save them. Upon becoming a Rahaga, Iruini quickly resigned himself to the mutation, and did not accept that Keetongu had the power to cure him. However, he was overjoyed to become a Toa again, adopting an adventurous attitude. First Toa Team: The first ever Toa team led by Toa Lesovikk, it included Toa Nikila and several other Toa, all of the team, save for Lesovikk, were killed in a battle against a tribe of Zyglak, due to a fatal hesitation on Lesovikk's part. Toa Mangai: Lhikan's team of 11. Known members include Nidhiki (voiced by Paul Dobson), Tuyet, Naho, and several Toa of Ice. All members were killed, except Nidihki, who became an arthropod-like Dark Hunter, and Lhikan (voiced by Michael Dobson), who became a Turaga after summoning the Toa Metru. All are deceased with the exception of Tuyet, who was recently revealed to be alive in the official web serial, Reign of Shadows. Jovan's Team: Jovan's Toa Team. Known Members included a Toa who died using The Ignika, another who wore an Elda to help track the Ignika, and one who wore a Kanohi Olmak to help his team escape the Energy Storms (All Later killed by the Makuta) Jovan became the turaga of Voya-Nui, but died when part of the island broke off. Toa Metru/Hordika: Vakama's team of 6. It included Nokama (voiced by Tabitha St. Germain), Vakama (voiced by Alessandro Juliani), Matau (voiced by Brian Drummond), Whenua (voiced by Paul Dobson), Nuju (voiced by Trevor Devall) and Onewa (voiced by Brian Drummond). Currently the Turaga of Metru Nui along with Dume. Toa Inika/Mahri: The original six Matoran who appeared in the Mata Nui Online Game turned into Toa through energy from the Red Star when the Toa Nuva were enslaved by the Piraka. These Matoran were Jaller, Hahli, Kongu, Matoro, Hewkii, and Nuparu. All six had electricity powers interlaced with their elemental powers, but were mutated by the Kanohi Ignika to adapt to water. All except Matoro, who sacrificed himself for Mata Nui's life, are currently active. Other prominent Toa include Krakua, Helryx, and Lesovikk. Takanuva was originally a Matoran named Takua. He was later hidden on Metru Nui during the Time Slip, and brought to Mata Nui. After being transformed into a Toa of Light by the Kanohi Avohkii, he renamed himself Takanuva (meaning Takua Nuva, as he considered himself a Toa Nuva, although he was not.) and fought and temporarily defeated Makuta Teridax. He later guarded Metru Nui in the Toa Nuva's absence, and fought Frostelus. He later intercepted a dark presence in his mind and went after the culprit, the Dark Hunter codenamed "Dweller". As he did, Makuta Icarax dropped a Shadow Leech upon him, (meant to bite Ahkmou and become a Shadow Toa) but was able to incinerate the leech with concentrated light, and fell unconscious from the light drain. His gold colored armor turned to a shining iron gray color, to symbolize the powers of light and shadow now surging through his right and left hands. He was then told by Helryx, Krakua, and Brutaka to go to Karda Nui. Brutaka opened a portal, but due to the damaged state of his Kanohi Olmak, led to several dimensional journeys, one resulting in him receiving a powdered Makuta virus from a good Krika, giving him the power of flight, before arriving in Karda Nui. There, he found the Toa Nuva in the swamps. Karda Nui is a light-based location, and any being with a light affiliation is supersized. Takanuva grew to a height of ten feet. Takanuva saw the Makuta Krika near Toa Gali Nuva, not knowing that Krika was trying to help her. He provided the Toa Nuva with vital information and fought against the Makuta. He witnessed Krika's death, having his density completely eradicated into microscopic particles, because he tried to warn them all of Teridax's betrayal. Enraged by this, he fought ferociously against the remaining Makuta. Vican, a mutated Le-Matoran, (a Shadow Matoran just minutes before) sought out Takanuva, and told him of the Klakk. The Klakk had the power to screech and shatter the barrier that prevented light from returning to Shadow beings. He then restored all Shadow Matoran to Av-Matoran, and lastly himself, turning him gold again. Takanuva then took the Matoran (Still mutated into bat-like creatures) to another location. He assisted the Toa Nuva in awaking Mata Nui, and left for Mata Nui. He, along with the other Toa have formed a revolt against Teridax when he took over the universe. When the Makuta landed on Bara Magna, Takanuva exited the giant robot onto the new planet, altering his colors in the process to not draw attention to himself. He assisted Tahu in retrieving the Golden Armor, killing two Heat Vision Rahkshi in the process. He has since returned to Gold and White. 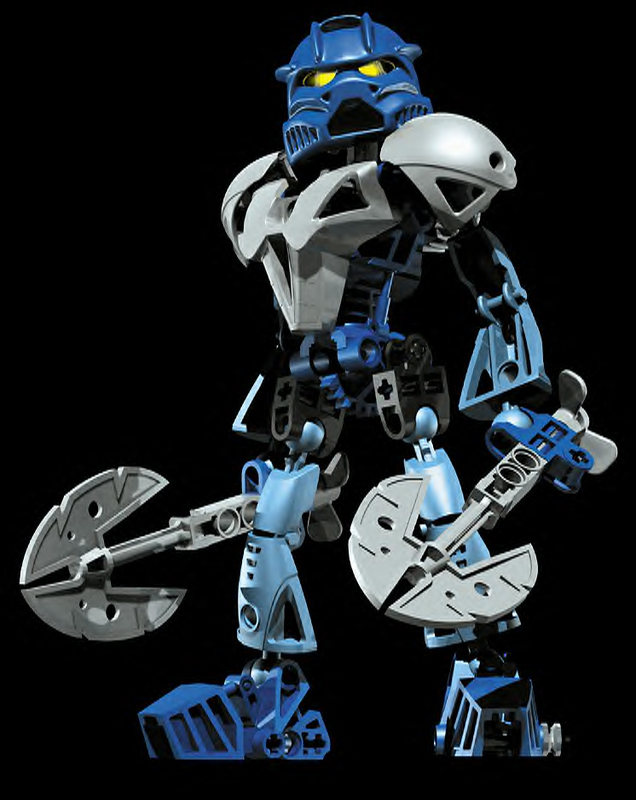 Krakua is a Toa of Sonics working for the Order of Mata Nui. He carries a Sonic Vibration Sword and wears a Suletu, which is shaped like a Great Hau. Krakua is currently the only Toa of Sonics still alive. Helryx was the first Toa ever to be created and is the leader of the Order of Mata Nui. Despite being a Toa of Water, Helryx is extremely fierce, somewhat impatient, and quick to anger. She always strives to achieve her vision of the greater good, no matter the decisions and choices she has to make to get it. She carries a spiked mace and a shield for melee combat and wears the Kanohi Mask of Psychometry, which allows her to see into a being's past just by touching him. Her mind is also shielded from outside mental presences, as is mandatory with Order training. Due to the nature of her role in the Order, Helryx excluded herself from the Toa Code, which stipulates that Toa cannot kill their opponents. Lesovikk is a guilt-ridden Toa of Air and the leader of the first Toa Team. Due to his hesitation, which led to his team's death, Lesovikk blames himself for causing their deaths, and considers himself unworthy to be a Toa. His self-perceived failure to live up to the standards of the Toa exempts him from the code, and he is willing to kill his opponents. Lesovikk carries an Air Sword and a Cordak Blaster as his main Toa tools. He wears a Faxon as his Kanohi mask. After Lesovikk arrived on Spherus Magna, he was suspected with killing Karzahni, as his sword was found near his body, but a message in the stars caused Kopaka to suspect otherwise. All Toa have elemental powers, which they can use to manipulate existing elements or create new substance, as well as physical traits they possessed as Matoran. These elemental powers recharge naturally over time - the amount the energy exerted will determine how long it takes to return to full strength. They also have the mental discipline to use Great and Noble Kanohi Masks (only the Toa Nuva can use Kanohi Nuva). An ability all Toa share is the ability to perform Nova Blasts in which they release all their elemental energies at once. This has only ever been seen once in the story, when Gali of the Toa Nuva leveled the realm of Karzahni with a wall of water in a last-ditch attempt to defeat Makuta Icarax; it took all her concentration to save the other Toa from drowning. Jaller planned to unleash a Nova Blast in the Pit to buy Matoro time from the armies of the Barraki, and would almost certainly have killed everyone in the immediate area by doing so. Six Toa can combine their elemental powers to create a Protodermis Seal. Any six Toa can do this as long as two of the Toa are not Light and Shadow, as the two are cancelled out. This ability has only been seen being done by teams consisting of a Fire, Ice, Water, Air, Stone, and Earth. Toa are also able to use their Toa Power to heal certain things and create Toa Stones, which contain some of their own Toa Power. When a Toa has united with others, completed his or her duty, and achieved his or her destiny, he or she can sacrifice all of his or her Toa Power, and he or she becomes a Turaga. They can also choose to give up their Toa Power before their destiny is complete, and will become Turaga upon fulfilling that destiny. In 2001, Lego faced legal action by Māori activists from New Zealand for trademarking Māori words used in naming the Bionicle product range for use in the Matoran language, including the names of some Toa, and even the word "Toa" itself. Despite this, many of the names of the Toa from Māori language, were still kept, though Lego was careful in naming characters from then on. ↑ Widdicombe, Rupert (2004-04-29). "Building blocks for the future". The Guardian (London). http://www.guardian.co.uk/technology/2004/apr/29/shopping.toys. Retrieved 29 December 2009. ↑ Farshtey, G (2007): Bionicle Encyclopedia: Updated Edition", Scholastic. ↑ Farshtey, G & Elliot, R (2005): "Comic 25: Birth of a Rahaga". 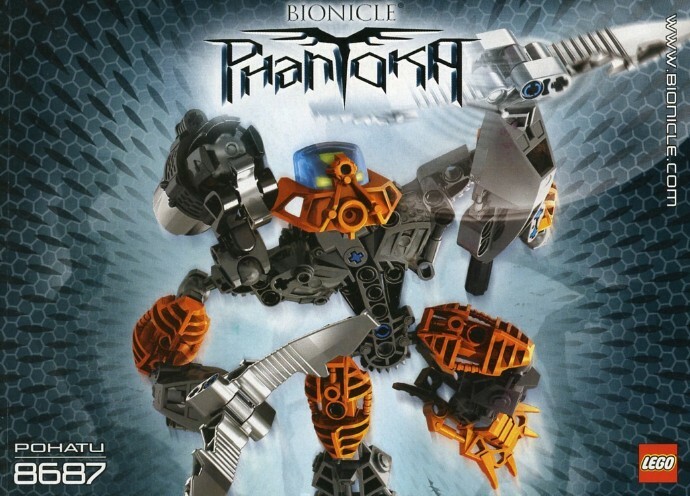 ↑ Farshtey, G (2007): "Bionicle Encyclopedia: Updated Edition", under "Rahaga", p. 118. ↑ "Lego irks Maoris". BBC News. 2005-05-31. http://news.bbc.co.uk/1/hi/world/asia-pacific/1362435.stm. Retrieved 2006-08-14.